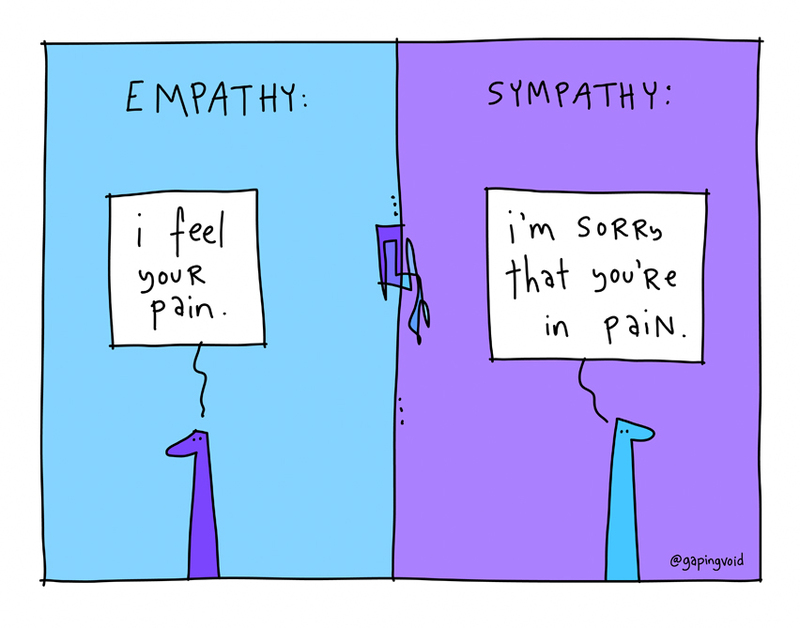 Sympathy is feeling compassion, sorrow or pity for the hardships of another while empathy is putting yourself in the shoes of another. Although compassion is often welcome, sorrow and pity do not enhance connection. All three are reactions to the plight of another, but empathy is sitting down with someone and feeling remembering the experiences you have had in similar circumstances. When my brother’s wife died of cancer, I felt sorrow and compassion, but because I had not yet lost someone so close to me, I could not empathize with him. All I could do was sit and hold space for him to grieve. So while I was trying to understand what he was going through, I had no personal understanding of his experience. On the other hand, when I have worked with men who were traumatized by a brutal father, I could empathize. I was able to remember my own father whipping me across the back of my legs saying, “This is hurting me more than it is hurting you.” I know what it feels like to experience my father wounds, and I have spent 25 years healing those wounds. It is quite natural for me to feel empathy with a man who has taken on an “I am not good enough” or an “I am not lovable” believe about himself because I shared that belief about myself. 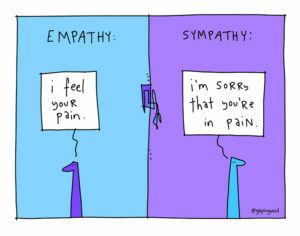 Empathy can be a powerful tool in helping someone heal. In the mid 1990’s, I had surgery on my nose. About ten days after the surgery I “sprung a leak” and woke up bleeding profusely from my nose. My wife drove me to the hospital where the doctor met us and packed my nose with gauze. There was a part of me that was detached, watching this whole experience dispassionately and objectively. I could see that the doctor was a competent mechanic working on a vessel. He treated me as if I were a car getting an oil change. He had neither empathy nor sympathy for the vessel he was operating on. I also knew that the part of me being worked on was beginning to have a severe stress reaction. I was able to tell the nurse that I needed someone to hold my hand. She understood immediately and turned her attention fully to me. She held my hand and smiled. I saw a small tear form in her left eye. And I felt the stress and fear melt away. That was all it took: just a moment of human connection and a generous dollop of compassion. So if you are sitting with someone who is experiencing emotional sadness, fear, shame or guilt, just be with them and find the time and place in your life when you felt the same feelings. Bring that memory into the present moment and deeper connection will result.